To help contacts understand what they're opting in to when submitting a form or pop-up form on your website, you can add notice and consent information. This allows you to capture a visitor's consent to the processing of their personal information as well as their consent to receive communication from you. 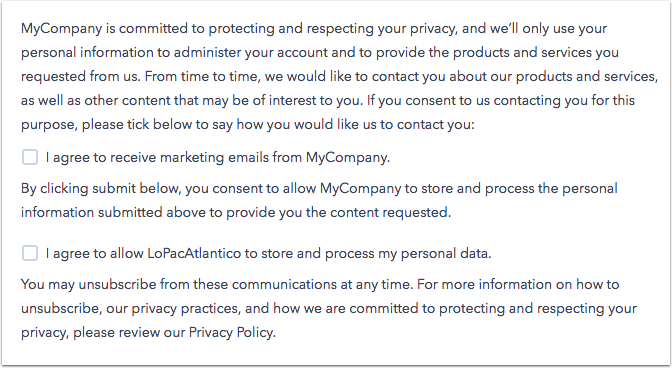 Whether or not General Data Protection Regulation (GDPR) enabled in your HubSpot account, you'll see an option in your forms and pop-up forms called Notice and consent / legitimate interest (GDPR). You can select from three canned options to set up how you wish to capture a contact's consent to process information and consent to communicate on the form. Please note: while these features live in HubSpot, your legal team is the best resource to give you compliance advice for your specific situation. If a contact fills out a form with notice and consent information, the Legal basis for processing contact's data property will be set to Freely given consent from contact and Lawful basis to communicate will appear in the subscriptions section of the contact record. In the upper right, click Create form to create a new form or click the name of an existing form. In the left panel, click to expand Notice and consent / legitimate Interest (GDPR), then click the dropdown menu. In the upper right, click Create form to create a new pop-up form or click the name of an existing pop-up form. Set the type and customize the callout for your pop-up form, then click Next to move to the Form tab. In the left panel, click the Notice and consent / legitimate Interest (GDPR) dropdown menu. 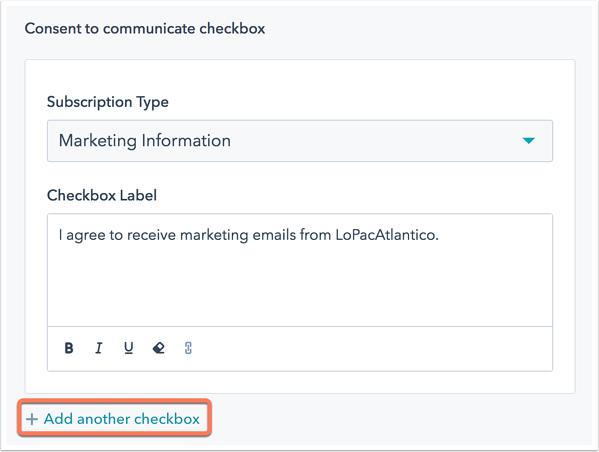 With this option, you can collect consent to communicate through an affirmative opt-in using a checkbox that specifies the communication/subscription type. You can add more than one checkbox to allow visitors to consent to communication for more than one subscription type. If a contact submitting the form doesn’t select the consent to communicate checkbox, the form submission is still processed, and the contact won't be subscribed to any communications. It is not possible to pre-select the consent to communicate checkbox, but you can make it required. Please note: if the contact has already subscribed in the past and subsequently doesn’t select the consent to communicate checkbox, this is not equivalent to the contact withdrawing their consent. There is a different process for withdrawal of their consent that they must follow instead. With this option, consent to process personal data is collected explicitly. The contact needs to select the consent to process data checkbox in order to give their consent. You cannot process a visitor's data and accept the form submission if they have not given explicit consent for you to do so. Without selecting this checkbox, visitors will be unable to submit your form. If you still want to offer the visitor access to your content without processing their data, you can do so by adding the consent to process footer with a hyperlink to your content. If your lawful basis of processing is legitimate interest instead of consent, this option to your form will display a notice letting visitors know that you need their information to contact them about your products and services and that they may unsubscribe from these communications at any time. With this option, the contact is not required to give their consent to you, and will just see a notice. In the form preview on the right, hover over the Notice and consent / legitimate interest (GDPR) field and click the pencil icon edit. Click the name of the pop-up form. In the left panel, click the pencil icon edit to the right of the Notice and consent / legitimate Interest (GDPR) dropdown menu. In the left panel, make your edits in the relevant sections. If you've selected the Consent checkbox for communications; form submit as consent to process or Consent checkboxes for communications and processing option, you can add additional subscription types/checkboxes to allow visitors to consent to communication from multiple subscription types on a single form. In the Consent to communicate checkbox section, click Add another checkbox. Click the Subcription type dropdown menu and select a subscription type. In the Checkbox Label section, make edits as needed. In the upper right, click Publish. This will take your changes live where your form or pop-up form appears.